Today was not a good day to encounter dolphins. The water was still murky in spots from way back when Tropical Depression Flossie passed through with her rain causing mud to run into the ocean. I was repeatedly startled when large dark shapes suddenly swam toward me. 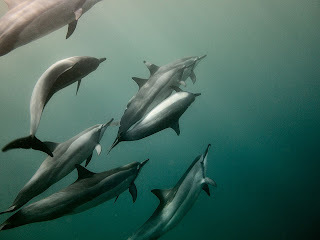 Even though I knew they were probably dolphins, in the gloom I could never be sure until they were right on top of me. 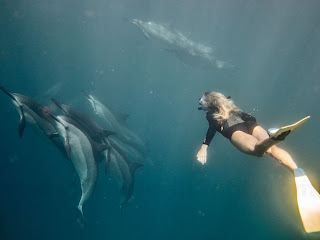 On the other hand it was a spectacular day for photographing dolphins. The muddy water made a nice dark backdrop for glowing dolphin bodies once they got close enough for me to see them. Even then, my camera saw them much better than I did. Check out this morning's spectacular photos by clicking HERE. Don't They Know Who I AM !? !